Dero is proud to partner with DEZIGNLINE™ to offer cities a suite of protected bikeway and pedestrian solutions to create safer streets. 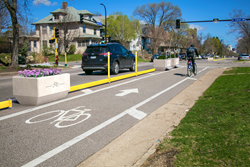 These systems are innovative, cost-effective modular infrastructure options that physically separate vehicular traffic from bike lanes and pedestrian zones. Designed to meet communities’ minimal-to-robust project needs, all DEZIGNLINE™ solutions are appropriate for new or retrofit construction, and for temporary or permanent installation. As DEZIGNLINE’s exclusive distributor, Dero now offers its complete suite of complementary, aesthetically-pleasing products: BIKERAIL™, PEDRAIL™, Planters, and the PEDISTILL® Hand+Foot Rest. Designed to meet communities’ minimal-to-robust project needs, all solutions are appropriate for new or retrofit construction, and for temporary or permanent installation. 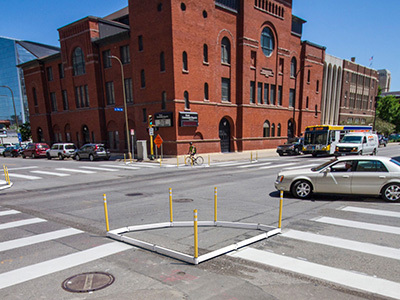 This system is a strong steel barrier designed to create a fully protected bike lane. Steel Rail sections are 5” x 3” and available in 4’ and 8’ lengths. This system creates safe pedestrian zones, including intersection bump-outs, center medians and refuge islands. Steel rail sections are 4” x 2” and available in 2’ and 4’ lengths. Both BIKERAIL and PEDRAIL feature narrow footprints and are comprised of segmental, modular components which make these systems easy to expand, contract, or reconfigure. Rapidly deployable, durable steel rails connect and swivel at RAILHINGE™ posts to create the desired barrier configuration; vertical delineators can be attached to any post. Street maintenance crews in northern climates appreciate the snowplow-friendly anchoring system, making for easy snow removal. There is also clearance underneath the rail which ensures storm water drainage. Available in galvanized or powder coat color. 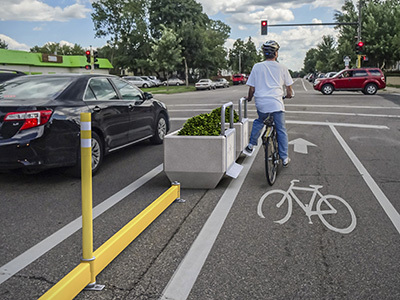 Planters offer a green solution that provides maximum protection to cyclists in a bike lane. DEZIGNLINE’s two sizes of architectural precast concrete planters are available in five colors, each with an acid wash finish. Additional options include a self-watering system, signage and PEDISTILL® accessories. This one-piece steel accessory attaches to a DEZIGNLINE Planter. 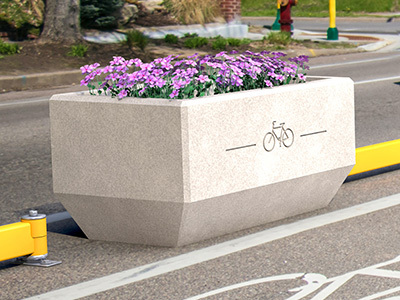 The planter-PEDISTILL combo is typically located in bike lane buffer zones at intersections and functions as a red-light rest stop for cyclists. The PEDISTILL is customizable and available in galvanized or powder coat color. Since 1995, Dero has been supplying innovative bike parking and bicycle transit solutions to architects, contractors, municipalities, higher education, and parks and recreation. Its bike racks, repair stands and pumps, shelters, and lockers are high quality, thoughtfully designed, and secure. Dero also offers the award-winning Dero ZAP, an automatic system to track bike commuters. Dero, a PlayCore company, is located in Minneapolis and is proud to support biking locally and nationally. Dero is recognized as a Platinum level Bicycle Friendly Business℠ by the League of American Cyclists. DEZIGNLINE is a branded suite of bicycle and pedestrian safety products offered by Dero and designed by Studio5051, LLC. Studio5051 is a Minneapolis-based design firm with 35+ years of experience in developing products and solutions that enhance the public realm. Working in partnership with urban design professionals, city officials and related stakeholders, Studio5051 created the DEZIGNLINE series to assist communities who are incorporating practical, efficient bicycle and pedestrian safety infrastructure into their transportation plans.